If diamonds are a girl's best friend, then the P5 Wireless are this woman's best friend. While they're undoubtedly luxury headphones, they are among the few that actually back up their exterior with beautiful performance to match. If diamonds are a girl’s best friend, then the Bowers and Wilkins P5 Wireless are this woman’s best friend. 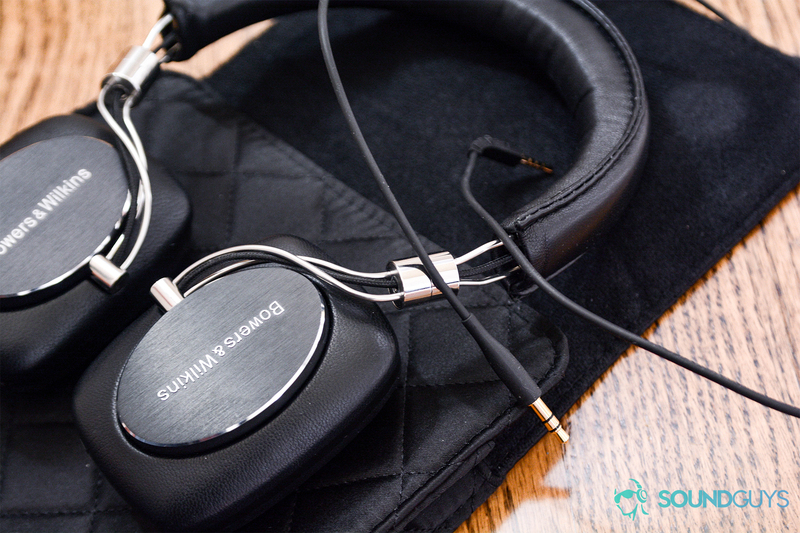 Leather bound and sporting metal accents, these headphones are absolute elegance. Across the pond in the UK, on what one can only assume was a rainy Seattle-like day, Bowers and Wilkins was founded. Their products span the gamut of audio equipment from home systems, to car stereos and, of course, to headphones. The Bowers and Wilkins P5 Wireless, in particular, is a work of dedicated craftsmanship. Aesthetically, it’s clear that Bowers and Wilkins believes there’s no point in fixing what ain’t broke, as the P5 Wireless physique is a clear call-back to it’s first iteration and its relatives: the P7 and P9. With these headphones, it’s okay to judge a book by its cover—because what’s under the hood is just as good as the well-crafted exterior. The Bowers and Wilkins P5 Wireless quilted carrying case keeps a slim profile and conserves space in a bag. Upon opening the box, it’s apparent that Bowers and Wilkins profoundly contemplates the image they want to project. They are a high-end, sophisticated brand, and their packaging reflects it. Blackened, brushed aluminum decorates the ear cups and connects to the leather-bound body. All the while, your eyes are met with metal rails running into a sheepskin headband with ample cushioning. Below, you’ll find a black woven carrying pouch, micro USB charging cable and an admittedly thin cable to enable wired listening. How are the Bowers and Wilkins P5 Wireless built? Given the above description, it should come as no surprise to you that I am a huge fan of the P5 build quality. It’s robust, intelligent, comfortable, and classy. Everything about the build is screams luxury, even if the headphones themselves don’t exactly sit in an unattainable price bracket. 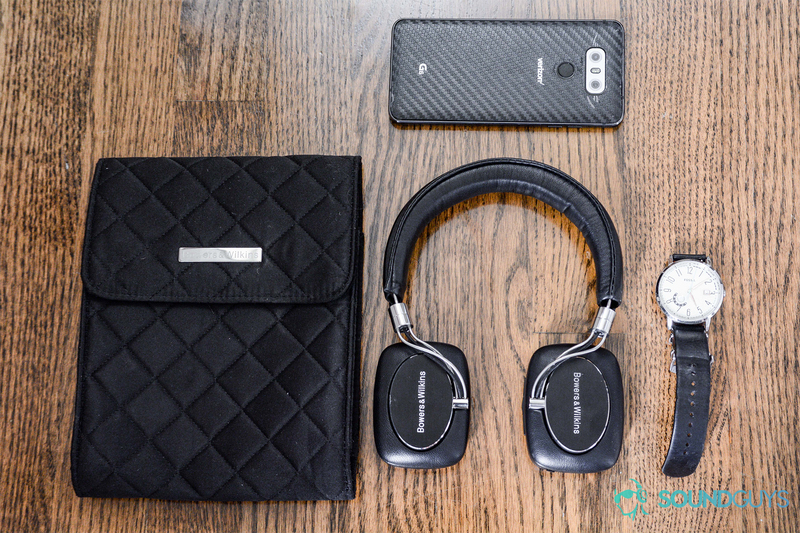 The black and silver color palette say that these headphones mean business, while the sheepskin, memory foam headband, and ear cups keep you comfortable. Being the self-proclaimed optimistic realist that I am, I have been able to find a few hiccups in the design. Since these are Bowers and Wilkins headphones, the design of the P5 Wireless is timeless. The sheepskin leather-sheathed headband and ear cups provide maximum comfort and sophisticated style. As it is with all other iterations of the Bowers and Wilkins P-models, the P5 wireless get a bit hot under the ears. This is definitely due to the soft, heat-trapping sheepskin that perfectly hugs the ears thanks to the dampening memory foam. Sweaty ears are annoying, but I’m still a fan of these pads. It’s hard to fault removable and replaceable pads on the off chance that general wear and tear gets the best of them. Worth noting, the headphones drooped down the crown of my head a few times, but that wasn’t a major issue by any means—your mileage may vary. Regarding the design, the Bowers and Wilkins P5 Wireless kept it smart. The three main controls (volume, playback, answering a call) can be found on the rear side of the right ear cup, and the power switch/Bluetooth activation is just a thumb-slide down. Having only four buttons made using the headphones intuitive and simple—as it should be. Unfortunately though, these controls don’t function when using the cable to connect the headphones rather than Bluetooth. Generally speaking, the dual microphones worked wonders when chatting on the phone. I came in crystal clear and the person on the other side of the call did as well. Oddly enough, the biggest nuisance of these became apparent when turning on and connecting to my phone. I had a hard time differentiating between the power on/off tones of the P5. Aside from that though, the headphones do connect quickly with my device now and stay that way for the duration of my listening. Additionally, aptX is supported for CD-like audio quality. The provided proprietary cable for the Bowers and Wilkins P5 Wireless may be thin, but it’s sturdy too. Something that’s worth noting though was that the volume is noticeably softer when using the Bluetooth function as opposed to a wired connection. Maybe it’s due to the increase in power required for a Bluetooth connection, or maybe I have a faulty device. At 22Ω, they should be smartphone friendly in terms of volume output capabilities. Either way, it sounded like full volume from wireless was two-thirds of what the wired connection was outputting. At the bottom of the right ear cup on the Bowers and Wilkins P5 Wireless, there’s an LED indicator. The battery life on the other hand was great. Now, I know that these are headphones, not earbuds, but I’m just so blown away by the battery life of the P5. They claim 17 hours of playback, and I hit that with about half an hour extra; pretty good, Bowers and Wilkins. Additionally, it’s great that you can still use the headphones when the battery dies via the provided cable. When that happens, recharging is just like most gadgets and gizmos: micro USB into the appropriate port (found in the right ear cup), ta-da! When you buy the Bowers and Wilkins P5 Wireless you get aptX support for high-quality audio streaming. Bowers & Wilkins nails it. The sound keeps a fairly-even keel, but that can be safely assumed by its aesthetic design. Despite keeping bass a little restrained, it’s not under emphasized by any means. It’s simply at a good place. There’s no bleeding into the mids, and there’s even a distinction between the sub and midbass. I can’t believe that I’m referencing Mayday Parade in any sense, but their song Take This to Heart is a great example of what I’m talking about. The drum hits are powerful, present and oh-so-clean. I typically think of this song as an angst-ridden, fuzzy mess in terms of sound, but the P5 shows that even Mayday Parade cleans up nicely with the right set of cans. Macklemore’s album GEMINI features Kesha in Good Old Days where everything in the midrange are precise well reproduced. Macklemore’s pensive verses breathe depth into the song via the P5’s ability to emphasize his raspy vocals. Piano keys lead the listener through the song’s “revel in the now” moral, and they sound fantastic. Each key is vibrant without sounding sharp. The dampening materials of the P5 help to passively isolate sound and bring out the richness of musical moments such as this. Get high off the highs of Curbside Prophet by a young Jason Mraz. I heard instruments in this song that I’d never heard before and, according to iTunes, I’ve listened to it well over 300 times. The banjo plucks came alive during this song as well as the talk box guitar. It made me rediscover a song that carried me through countless school bus rides through dusk-kissed suburban streets. Should you buy the Bowers and Wilkins P5 Wireless? Well, this review has been nostalgic for me, as the original B&W P5 headphones served as my very first headphone review that I ever did while a sophomore in high school. It’s great to see that B&W still stands as a company with integrity, and one that values quality without cutting corners. If you’re on the fence about these and the wallet doesn’t mind, these are a fabulous investment. The versatility, quality and comfort all exceeded my already high expectations, and I’m confident that they’ll exceed yours too. Bowers & Wilkins P5 Wireless combines fantastic sound and luxurious materials with advanced Bluetooth streaming for an unrivalled wireless acoustic performance. Best-in-class acoustic design. The best Bluetooth streaming technology. Put these together, and you can enjoy all the freedom and convenience of wireless headphones, without compromising on sound quality.